Beautiful brown and jade cabinet created by forming a carcass to fit around salvaged antique doors sourced somewhere in India. This cabinet also has two small drawers. One of our very special units that constructed by constructing the body of a cabinet around a pair of antique doors. The doors of this unit are distressed brown in their colouring and still have their original metal colouring and two large metal ringed handles for access. 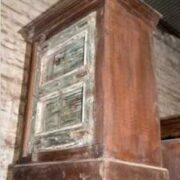 The rest of the front of the cabinet, its frame and drawer fronts, are more jade green in colour whereas its decorative panelled sides are a more subtle brown. The combination of these colourings makes for a unique piece. Internally the this cabinet has 3 shelves and, combined with two deep drawers at the unit’s bottom, mean that this cabinet has a healthy amount of storage and would be perfect for any living room, dining room or bedroom and while surely catching the eye.